I encountered George Vellonakis, the architect (albeit unlicensed) behind the unnecessary and controversial, extensive redesign of Washington Square Park, a few Sundays ago at the Park. I first saw Mr. Vellonakis outside the fenced-off Arch talking to a group of about 8 people who I assumed were his friends. However, once I made my way to the southern side of the Park, there he was inside the currently-under-construction NorthWest Quadrant clearly giving a private tour. I could not hear every word but for a few comments … about the Minetta stream which runs under Washington Square Park (which I learned about in preparation for my own walking tours) and the trees that had lined the fountain (those 40 year old trees are no longer, chopped down under his plan) and so forth. As he stood there with the newly aligned fountain behind him (under construction but moved 23 feet east to be in ‘line’ with the Arch at Fifth Avenue – allegedly his idea) and this group around him, he seemed quite pleased with himself. I thought… this would be a great picture. As I attempted to take that picture of him amidst his crew, he started hiding behind them. I didn’t realize this was on purpose at first – I thought he was just moving into different locations. Mr. Vellonakis and I have never met. Once I realized what was transpiring, I was bemused to say the least. I looked at him quizzically and he smiled, sweetly, and said “No Pictures Please.” I was a bit taken aback. (Huh?) I asked him, “Are you camera shy?” The people on the tour looked at me quizzically and could not figure out what was going on. So… why do you think George Vellonakis did not want his picture taken ? Why is he giving private tours of the under-construction part of this public space which is off-limits to everyone else? And… Who do you think the people were he was giving a private tour to? The New York Times reports today “After Term Limits vote, Tensions Rise At City Hall.” Some hopeful information (at last) is revealed following last week’s vote. 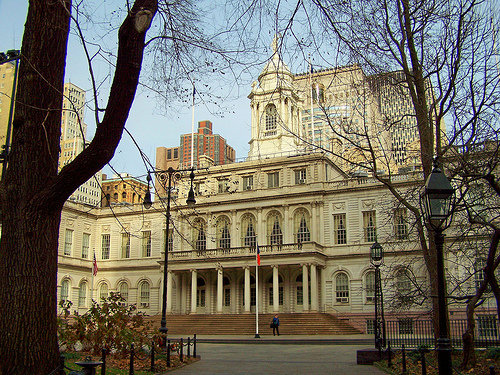 You remember … this is where the NY City Council voted 29-22 to overturn voted-in (two) term limits to allow Mayor Bloomberg – and themselves – a third term. Tensions between City Council Speaker Christine C. Quinn and aides to Mayor Michael R. Bloomberg are erupting just a week after Ms. Quinn shepherded the mayor’s divisive legislation to loosen the city’s term limits law through the Council. Feelings are raw between the two sides largely because Ms. Quinn took heavy political shrapnel for the mayor during the term limits battle as she rounded up support for what became an unusually difficult vote. The current issue that’s ruffling Speaker Quinn’s feathers – and much of the City Council – is over the Mayor’s wish to change the structure of how programs for the elderly are financed. Mr. Bloomberg is hoping to push this restructuring through the City Council next. He has rarely faced heavy opposition from the Council (particularly under Ms. Quinn’s “leadership”) except for this recent overturning-the-will-of-the-voters thing. “The tensions reveal the degree to which the bruising term limits battle, initiated by the mayor so that he can run for a third term, altered the political landscape, with Ms. Quinn and her colleagues feeling empowered to challenge the Bloomberg administration as never before,” the article continues. As he stated he would at the end of last week, this week, Mayor Bloomberg began calling members of the City Council to try to ease the tension over the vote. However, as a CEO, our billionaire Mayor doesn’t think that he needs to cater to the whims of the Council whose members he obviously considers his employees. So he didn’t stop, as expected, on the calls at discussing the term limits vote, he started wrestling for the next vote. His attitude is … you did what I wanted, now this is what I want next. Apparently, the City Council members are not taking so kindly to that attitude. Update: So, a reader named Steve wrote in and said “Don’t be so naive. This story was planted by the City Council!” Steve has a point. Earlier, the thought crossed my mind that Bloomberg and Quinn might have come to some agreement for her to save face and let stories like this through. But I’m looking for some hope here! A story can be planted and still be true – the question becomes what degree of truth. ? And how do we ever know for sure? I’m taking a blogging break today. Back tomorrow. “…if devoting so much intellectual effort to such a dubious undertaking might have seemed indulgent a year ago, today it looks delusional. It’s not just that New York and much of the rest of the world are preoccupied by economic turmoil, although the timing could hardly be worse. It’s that the pavilion sets out to drape an aura of refinement over a cynical marketing gimmick. Surveying its self-important exhibits, you can’t help but hope that the era of exploiting the so-called intersection of architecture, art and fashion is finally over. Opening the pavilion in Central Park only aggravates the wince factor. Frederick Law Olmsted planned the park as a great democratic experiment, an immense social mixing place as well as an instrument of psychological healing for the weary. The Chanel project reminds us how far we have traveled from those ideals by dismantling the boundary between the civic realm and corporate interests. So what’s the cost to place a 7,500 square foot ad in Central Park? And the Tisch Family paid a paltry $2.5 million to get their name – arguably – forever on the Washington Square Park Fountain…? Well at least everything under Parks Commissioner Benepe and Mayor Bloomberg. ** This may just be the new “Waterfalls” — hopefully it won’t kill any trees or other living beings. Note: I’m not advocating that people view this (I’d rather not give Mayor Bloomberg additional reason to tout economic benefits – of dubious projects – that don’t exist. See also: Waterfalls) but, if you feel you must attend, the installation is free but tickets are reserved online. * Read Metro’s July 25th story here. * New York Times advance “slide show” of the “exhibit” which is equal parts art/spaceship/Chanel handbag ad. *WSP Blog Previous post on this from July 25th. New York University has dramatically expanded its real estate tentacles and University purple flags throughout New York City over the last seven years under Mayor Bloomberg. 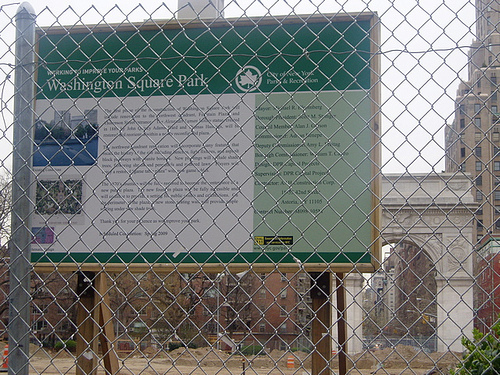 Many believe that the University, which holds most (if not all) of the real estate surrounding Washington Square Park, pulled strings behind-the-scenes with the Bloomberg Administration to impose the dramatic redesign of this park over the wishes of the community. So, it should come as no surprise where NYU President John Sexton would fall on term limits, and the extension of Mayor Bloomberg’s reign. When Mr. Sexton appeared before the New York City Council during the public hearing the same day I did, I was surprised to see him there. And yet, would I have expected a University president to give such an uninspiring and unthoughtful testimony as to why term limits should be extended, thereby overturning a public vote via legislation? No. The NYU President appeared a few panels following mine on Friday, October 17th, at City Hall in the City Council Chambers. (There were typically panels grouped together of 4-7 people.) During the two hearings, most of the well known politicians and corporate CEOs appeared early on, given preference in the order of the day. But there he was later in the afternoon. I had a hard time following Sexton’s testimony. It was very up is down. He never spoke about how NYU, which is the #2 or #3 real estate holder in the city, has benefited from Mayor Bloomberg’s reign. However, it was underlying in his testimony which otherwise offered little logic or reason. I can only imagine what advice he gives graduating NYU Seniors. Interesting the reports that as Mayor Bloomberg left City Hall yesterday after the vote, he was surrounded, even “chased,” by “protesters.” I would have been interested in witnessing that. I’m fairly certain our billionaire Mayor has not encountered this much to date. People are so convinced that he has a “high” approval rating, “protesters” have mostly left him alone. But, alas, this may all change. The Mayor may finally see that there are repercussions for his manipulative actions. After yesterday’s vote to extend term limits, Mayor Bloomberg issued a statement praising the City Council for giving “the people of New York a fuller choice” in the 2009 election. I’d surmise he should expect more of that. While employees in a corporation … for example … Bloomberg, L.P.? … cannot publicly criticize and deride their bosses (and keep their jobs), citizens in a democracy can still protest the disturbing and unethical actions of their elected officials. Even ones who have bought their way into office. Interesting article today at the New York Times site about Council Member Darlene Mealy (Brooklyn) who close to two weeks ago was at a press conference with Comptroller William Thompson (a Mayoral candidate) speaking out against City Council overturning of term limits. What could have transpired in such a short time to convert one of the strong voices of the opposition to a supporter the mayor’s bill? Some of her colleagues have charged that Ms. Mealy was the subject of a high-pressure effort from either the speaker of the mayor. In fact one Council member reported seeing Ms. Mealy emerge from City Hall late last week in tears, saying that she was the subject of intense pressure. “They put unbelievable pressure on her in a way that may have been unethical,” said City Councilman Charles Barron, who represents an adjoining district to Ms. Mealy in Brooklyn and who was a strong opponent of the mayor’s bill. “Mealy, considered mercurial, was under constant watch by Quinn aides from the moment she entered the council chambers to the moment she left. When she was summoned out of the council chambers at 2:45 p.m., there was a flurry of speculation. It turned out to be a routine break. Quite incredible, isn’t it? Partly that it’s all so out in the open (which is … great?) and largely that this is how Bloomberg and Quinn do their bidding. And indeed I believe it is. Stay tuned. 11:30 a.m. — Well, the NY City Council Committee on Governmental Operations voted this morning 6-0 in favor of letting the term limit vote proceed, and so it will this afternoon. I wish I could tell you I thought any of the City Council members who voted for it said anything truly compelling. It sounded mostly self-serving. Sewell Chan and Michael Barbaro continue their comprehensive and fine reporting on this issue at the New York Times site. These pro forma hearings only provide the appearance of a public debate at City Hall. In reality, the vote has already been fixed on the most important issue to emerge in our generation regarding the future of democracy in our city. Thank you Mayor Bloomberg! – Antonio G.
Friday, October 24 * 7:30 pm & Saturday, October 25 * 10 a.m. – 4 p.m.
What are we up against? What are our visions & possibilities? Henri Lefebvre’s “The Right to the City” was published in Paris in 1968. Lefebvre’s approach challenges the primacy of market forces — and the taken-for-granted capitalists’ quest for profit — in determining how and where people live and how government should work and what it should do. The “Right to the City” is not just about the right just to be in the city, but about fighting for the right to govern and control urban space and the right to live in a society where the needs of our most vulnerable urban residents — not developers — are put at the center of public policy. So, the right to the city includes not only the right to housing and food; but also the right to excellent public education; the right to public space and culture; the right to environmental justice; the right to living-wage jobs and health care; the right to citizenship for all; the right to live without state surveillance and police repression, which historically has targeted people of color, immigrants and women, queer and transgendered people, among others. An important development here in the United States is the Right to the City Alliance that was formed in 2007 and includes dozens of grassroots organizations across the country dedicated to strengthening urban struggles and fostering regional and national collaborations. David Harvey is a Professor of Anthropology at the CUNY Graduate Center. He is author of The Urban Experience, The Limits to Capital, The Condition of Postmodernity, Justice, Nature and the Geography of Difference, Spaces of Hope, and Spaces of Capital, among other works. Other workshop leaders and speakers for the two days can be found at the Brecht Forum site.